Take a tour of Tanoan! Judson and Sharon McCollum welcome you to TanoanHomes.com! Tanoan is the perfect place to be if you’re looking for a beautiful home in the secure and private Tanoan estates! This wonderful gated community has a country club and gorgeous golf course, as well as incredible mountain views! Please continue to learn about this amazing area! Tanoan is a well established area of custom homes in a private country club golf course gated community. It is divided into two areas, Tanoan Country Club East and Tanoan Country Club West. Tanoan East is subdivided into smaller communities: Highlands, Country Club Estates, Inverness at Tanoan, Broadmoor, Lalique & The Enclave at Tanoan. Tanoan West includes Kingswood, Wimbledon West, Cypress Point, Torrey Pines, Village Green, The Champions, The Masters & Fairways Estates. The various subdivisions offer different home styles and price ranges. Click here for useful Community web links! Each area has their own Homeowners Association & security gates with Guards. This lush green landscaped community features custom homes on landscaped lots with lush lawns, mature trees and shrubs and privacy walls. Tanoan homes are custom designed to suit the lot and capture the best views of the golf course and Sandia Mountains. Tanoan Country Club and Golf Course are separate from Tanoan East and West HOA. The Home Owners Associations have a good working relationship with the associations, yet the HOA’s have no responsibility for the Country Club and Golf Course. For the avid golfer, the neighborhood is conveniently built around the Tanoan Country Club. This private club on site offers golf, tennis and social memberships. Tanoan Country Club is situated at the base of the Sandia Mountains and features 27-holes of championship golf offering a variety of challenges. 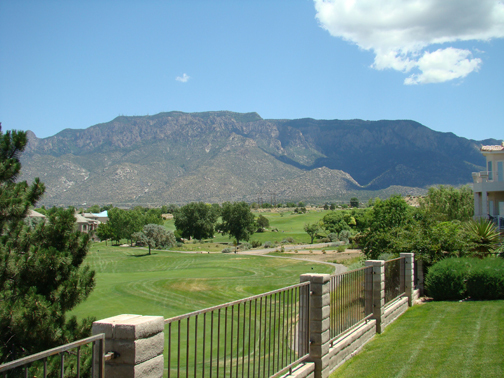 The Sandia Mountains rise dramatically 5,000 feet above the Tanoan Golf Course. With dramatic views, undulating fairways, three unique, nine-hole layouts, and extensive water hazards, this layout will test your focus and shot-making abilities. When not on the course, you can relax with friends in the casual café, serve up a game of tennis or unwind by the pool. At Tanoan Country Club, you’ll find something for every member of your family. The championship golf course is challenging yet fun for all skill levels. The 14-court tennis facility and swimming pool offer plenty of options for family fun. The Tanoan Home Owners Association website is found at http://www.tanoantalk.com/ if you would like more information.